2.Reverse the pattern and cut it onto the vinyl sheet with a craft cutter. Place the sheet with your design on to your shirt and place the teflon sheet on the top of your design. 5.Peeling the clear pet film after the vinyl turns cold, just in 15-30 seconds later for the vinyl to cool down. 1.Make sure there are no wrinkles on the material. 2.If you are having trouble, try turning the shirt 90 degrees and pressing again, this should eliminate problems from cold spots. 3.If you've already ruined one shirt, keep using it to experiment. Cut small pieces of heat transfer and try raising or lowering your temperature, or pressing longer or for less time. 4. Please wait for at least 24 hours to wash your design. 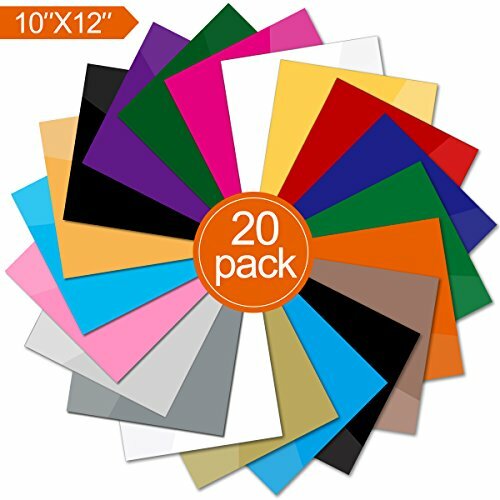 The heat transfer Vinyl Pack is made up of 18 Colors, including 2 black and 2 white sheets. If you have any questions about this product by STORUP, contact us by completing and submitting the form below. If you are looking for a specif part number, please include it with your message.